Our Database Management System Tests allow you to experience an online examination in the real-time environment. In every online test on Database Management System, you will be presented with Multiple Choice Questions (MCQs) which will test your skills in Database Management System Concepts in a detailed and comprehensive manner. In the test, each question will have 4 options to choose from. You should select only 1 correct option as an answer and then move on to the next question. Once you submit answers to all the questions, you will be given your final test score. In the Online Database Management System Test, for every correct answer, you will be given 2 points. There will also be negative marking of -1 for every wrong answer. So, you will have to be more careful in choosing the answers to the question in your online examination. If needed, you should skip to the next question and come back to the previous question later so that you can do proper time management for the online mock tests. 1. "Database Management System Practice Tests" - In Database Management System practice tests, there will be a series of practice tests wherein you can test your Database Management System concepts on every chapter separately. There will not be any time limit on these tests. So, Database Management System Practice Tests should be the first set of tests which you should attempt. Goto these practice tests here. 2. "Database Management System Mock Tests" - In Database Management System mock tests, there will be a series of mock tests wherein you can test your Database Management System concepts on every chapter separately, but there will be a fixed time limit per test. So, it is similar to Database Management System Practice Tests, but with an added constraint of time limits. 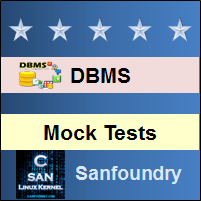 You should try Database Management System Mock Tests if you are appearing for any online examination soon. Goto these mock tests here. 3. 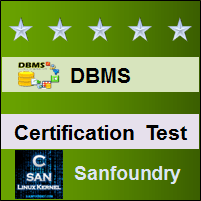 "Database Management System Certification Test" - Once you are through with your Database Management System concepts, then you should try our Database Management System Certification Test wherein Sanfoundry will issue a free Certificate to you if you scored either Grade A* or Grade A in Database Management System Certification Test. Goto Database Management System Certification test here. 4. "Database Management System Internship Test" - If you are interested to do Internships in Database Management System at Sanfoundry, then you must take our Database Management System Internship Test. If you scored either Grade A* or Grade A in Database Management System Internship Test, then you are eligible for Internship at Sanfoundry in Database Management System. Goto Database Management System Internship test here. 5. "Database Management System Job Test" - If you are a fresher, a dropout, an experienced person and if you know Database Management System well and looking out for jobs in Database Management System domain at Sanfoundry (or our Network of Companies), then you should try and qualify our "Database Management System Job Test". 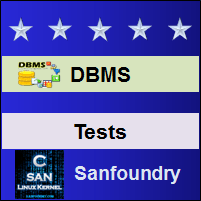 If you scored either Grade A* or Grade A in Database Management System Job Test, then you are eligible for a Job at Sanfoundry (or our Network) in Database Management System domain. Goto Database Management System Job test here. For every "Database Management System Practice Test", Total Questions: 20, Total Time: Unlimited. For every "Database Management System Mock Test", Total Questions: 20, Total Time: 20 Minutes. For "Database Management System Certification Test", Total Questions: 50, Total Time: 1 hour. For "Database Management System Internship Test", Total Questions: 50, Total Time: 1 hour. For "Database Management System Job Test", Total Questions: 50, Total Time: 1 hour. Before you get started on these series of online tests on Database Management System, you should learn, study and practice our collection of 1000 MCQs (Multiple Choice Questions and Answers) on Database Management System here. We also prefer that you should practice Database Management System practice tests and mock tests completely before attempting the certification test. Here is the list of online practice tests and mock tests on Database Management System. Each online test focuses on a "Specific chapter of Database Management System". So, you should try both practice test and mock test on every chapter to do a self-assessment of your knowledge (along with time-limit constraints) in every area or sub-topic of Database Management System. Database Management System Certification test, Internship test, and Job Test are mentioned at the end of this list. 1. Database Management System Test 1 – This set of online test on “Database Management System” tests your skills on Relational Database and Database Schema, Keys, Relational Query Operations and Relational Operators, SQL Basics and SQL Data Definition, SQL Queries, Basic SQL Operations, Set Operations, Null Values Operations, Aggregate Functions and Nested Subqueries – 1. 2. Database Management System Test 2 – This set of online test on “Database Management System” tests your skills on Aggregate Functions and Nested Subqueries – 2, Modification of Database, Join Expressions, Views, Transactions, Integrity Constraints, SQL Data Types and Schemas, Authorizations, Access SQL From a Programming Language. 3. Database Management System Test 3 – This set of online test on “Database Management System” tests your skills on Functions and Procedures, Triggers, Recursive Queries and Aggregation Features, OLAP, Relational Algebra, Tuple Relational Calculus and Domain Relational Calculus, The Entity-Relationship Model, Constraints, Entity-Relationship Diagrams. 4. Database Management System Test 4 – This set of online test on “Database Management System” tests your skills on Entity-Relationship Design Issues, Extended E-R Features, Atomic Domains, Normal Forms, Functional-Dependency Theory, Algorithms for Decomposition. 5. Database Management System Test 5 – This set of online test on “Database Management System” tests your skills on Multivalued Dependencies, Database Design Process, Application Programs and User Interfaces, Web Fundamentals, Servlets and JSP, Application Architectures, Rapid Application Development, Application Performance, Application Security. 6. Database Management System Test 6 – This set of online test on “Database Management System” tests your skills on Encryption and Its Applications, Physical Storage Media, Magnetic Disk and Flash Storage, RAID, Tertiary Storage, File Organisations, Organization of Records in Files, Data-Dictionary Storage, Database Buffer, Ordered Indices. 7. Database Management System Test 7 – This set of online test on “Database Management System” tests your skills on Hashing techniques, Ordered Indexing and Hashing, Bitmap Indices, Index Definition in SQL, Query Processing, Selection Operation, Sorting, Join Operations, Evaluation of Expressions. 8. Database Management System Test 8 – This set of online test on “Database Management System” tests your skills on Transformation of Relational Expressions, Estimating Statistics of Expression Results, Materialized Views, Advanced Query Optimization, Transaction Concept, A Simple Transaction Model, Storage Structure, Transaction Atomicity and Durability, Querying database – 3. 9. Database Management System Test 9 – This set of online test on “Database Management System” tests your skills on Querying Database – 4, Querying database – 5, Implementation of Isolation Levels, Transactions as SQL Statements, Lock-Based Protocols, Deadlocks, Multiple Granularity, Multiversion Schemes, Snapshot Isolation. 10. Database Management System Test 10 – This set of online test on “Database Management System” tests your skills on Insertion Deletion Predicate Reads, Concurrency in Index Structures, Failure Classification, Recovery, Buffer Management, Failure with Nonvolatile Storage, ARIES, Lock Release and Undo Operations, Remote Backup Systems. 11. Database Management System Certification Test - This set of online free certification test on "Database Management System" tests your skills on all areas (all chapters, topics and subtopics) of Database Management System. 12. 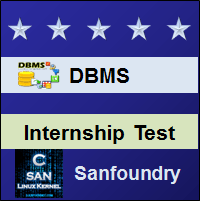 Database Management System Internship Test - If you scored either Grade A* or Grade A in our Database Management System Internship Test, then you can apply for Internship at Sanfoundry in Database Management System. 13. 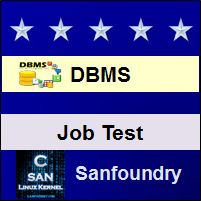 Database Management System Job Test - If you scored either Grade A* or Grade A in our Database Management System Job Test, then you can apply for Jobs at Sanfoundry in Database Management System domain. Best Wishes for your Database Management System Tests!